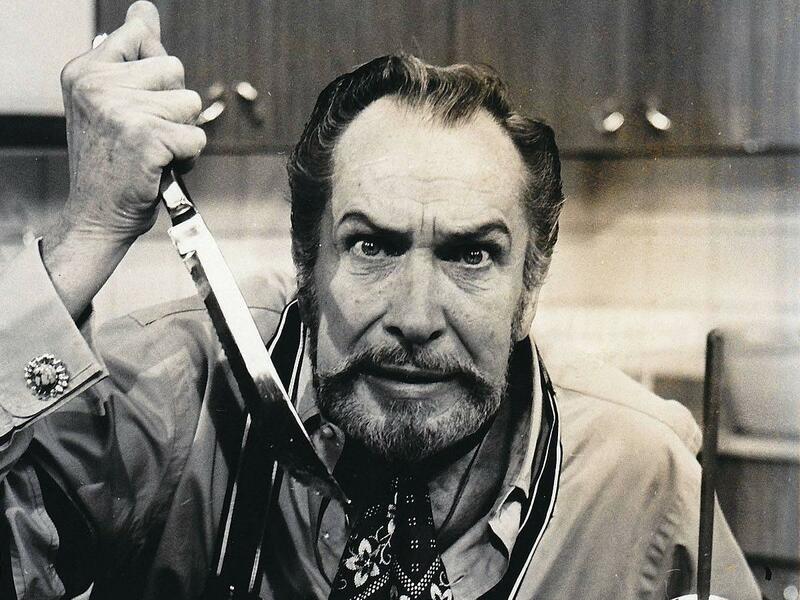 Famous horror film actor Vincent Price also co-wrote a best-selling cookbook in the 1960s with his then-wife, Mary. The original cover of the book, A Treasury Of Great Recipes, is seen at left. It's just been reissued. 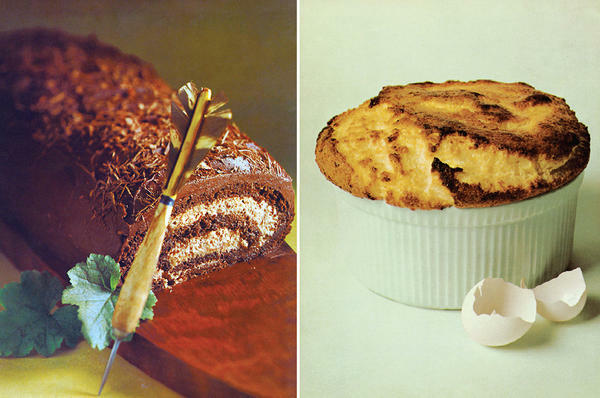 The Prices' cookbook included recipes for Whitehall Club Chocolate Roll and Soufflé au Grande Marnier, photographed by artist Tosh Matsumoto. The late Vincent Price was a horror film icon. With perfect elocution, he delivered creepy invitations to haunted houses in such movies as House of Wax (1953) and House on Haunted Hill (1959). He was a regular on TV's Hollywood Squares and a villain on the 1960s TV series Batman. Price's deep voice narrated Michael Jackson's 1982 music video for "Thriller" and was an inspiration to director Tim Burton. But Price was also a foodie. Price and his second wife, Mary, were such food connoisseurs that in 1965, they wrote a best-selling cookbook, A Treasury of Great Recipes. It's been out of print until now. Victoria helped get the book reissued for its 50th anniversary, with a preface by chef Wolfgang Puck. Victoria Price remembers her father spending hours perfecting creme brulee, and hosting lavish dinner parties at his Beverly Hills mansion. She writes of her mother, a costume designer, creating the perfect atmospheres for the parties: She once copper-glazed an entire set of dishes for one meal. "She was Martha Stewart way before Martha Stewart," Price told NPR. "And then my dad was the ultimate convivial host and just pure joy. Everybody wanted to come to a dinner party. But their dinner parties weren't about the A-list. Their dinner parties were people they loved." Their guests included Hollywood producers, artists, comedian Fanny Brice's son, Grace Kelly's publicist, even a young actor by the name of Dennis Hopper. And what the Prices served was just as eclectic — from recipes they'd gathered as they traveled the world. Their cookbook includes dishes from some of the most famous restaurants in Europe, the U.S. and Mexico. "If you eat some of these recipes one too many times, I think your cholesterol level might just go ballistic. There's a lot of butter; there's a lot of heavy cream. But the ones that are people's favorites are actually pretty easy to make, and they're kind of classic," says Price. The cookbook includes Mad Men-era recipes, old menus, the original typeface and the original photos by jazz photographer William Claxton, Life magazine's Eliot Elisofon, and artist Tosh Matsumoto. The images feature sumptuous spreads and waiters from legendary restaurants around the world. There's stuffed trout from La Pyramide in Lyon, France; gazpacho Andaluz from the Sobrino de Botin in Madrid (considered the oldest restaurant in the world); frog's legs polonaise from Sardi's in New York. Price says her folks also believed that gourmet was not just for the elite and that ambience was everything. So they also included recipes for French toast, which they used to eat on the Santa Fe train from LA to New Mexico, and hot dogs, like the kind they relished while watching the Dodgers play baseball. Vincent and Mary both liked to cook, as they told TV's This is Your Life in 1973. "We each have our specialties," Mary admitted. "So together we add up to be one pretty good cook." The Prices divorced that same year. But their cookbook has remained a collectible classic. Victoria Price says for years, chefs have treasured the book, and many readers have told her about how much they've loved to cook from it, often given as a wedding gift. Price can still remember having to curtsy at her parents' dinner parties. And she recalls her father's wicked sense of humor. With NPR, she shared one Halloween memory, of going house to house in Beverly Hills: "My dad would accompany us, and would jump out of bushes and scare the owners of the house," she says. "So we got the treat and they got the trick." 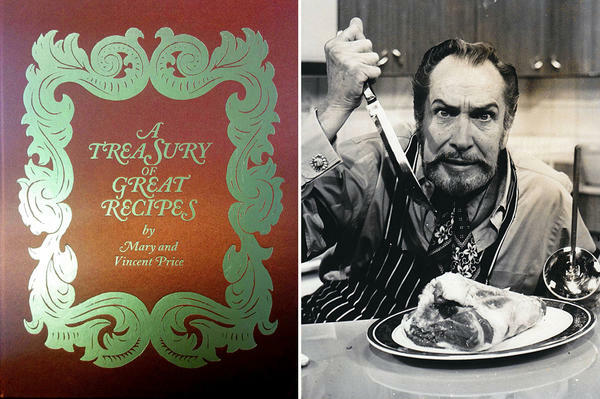 With his cookbook in print again, Vincent Price lives on. And in time for Halloween, here's a voice from beyond. VINCENT PRICE: Darkness falls across the land. The midnight hour is close at hand. GREENE: That is the late Vincent Price from Michael Jackson's "Thriller." You know, Price became a horror film icon, and based on that voice, he is not a guy I'd want making me dinner. But it turns out he was a foodie. He and his second wife were both food connoisseurs. And as NPR's Manalit del Barco reports, they wrote a best-selling cookbook that has been out of print until now. MANDALIT DEL BARCO, BYLINE: In the 1959 thriller "House On Haunted Hill," Vincent Price's character welcomed all to his creepy house party. VINCENT PRICE: (As Frederick Loren) There'll be food and drink and ghosts and perhaps even a few murders. You're all invited. VICTORIA PRICE: He loved food. Well, he loved life. He had an omnivorous appetite for life and for food. DEL BARCO: Victoria Price remembers her father spending hours perfecting creme brulee and hosting lavish dinner parties at his Beverly Hills mansion. Price says her mother, Mary, was a costume designer, keen on creating the perfect atmosphere. She once copper glazed an entire set of dishes for one meal. VICTORIA PRICE: Just because she thought that's what it called for. I mean, she was very much Martha Stewart way before Martha Stewart. And then my dad was the ultimate convivial host and just pure joy. Everybody wanted to come to a dinner party. But their dinner parties weren't about the A-list. Their dinner parties were people they loved. DEL BARCO: Fanny Bryce's son, Grace Kelly's publicist, even a then-unknown actor by the name of Dennis Hopper - and what they served was just as eclectic, created with recipes they'd gathered from chefs at some of the most famous restaurants in Europe, the U.S. and Mexico. In 1965, the Prices put together "A Treasury Of Great Recipes." VICTORIA PRICE: I mean, if you eat some of these recipes one too many times, I think your cholesterol level might actually just go ballistic. But there's a lot of butter. There's a lot of heavy cream. But the one that I think that are people's favorites are actually simple to make and they're kind of classic. DEL BARCO: French toast, beef fillets, even hot dogs, like the kind they relished while watching the Dodgers play baseball. And they both cooked as they told "This Is Your Life" host Ralph Edwards in 1973. RALPH EDWARDS: Who - Mary, who really does the cooking in the Price home now? VINCENT PRICE: I want to get this. MARY PRICE: Well, we each have our specialties, so together we add up to be one pretty good cook. DEL BARCO: Vincent and Mary Price divorced that same year. Their cookbook went out of print after its final run in 1977, and it's become a collectible. As the 50th anniversary approached, Dover Publications contacted Victoria Price about reissuing it. For her preface, Price remembers having to curtsy at those dinner parties. And for NPR, she shares one Halloween memory of going house to house in Beverly Hills. VICTORIA PRICE: My dad would accompany us and would jump out from behind the bushes and scare the owners of the house, so truly trick or treat. We got the treat and they got the trick. DEL BARCO: With his cookbook in print again, Vincent Price lives on. VINCENT PRICE: Can you dig it (laughter)?